Professors Jeffrey Shaw and Sarah Kenderdine are the brains behind Re-ACTOR, a six-screen installation that records, analyses and archives the intricate movements of kung-fu masters. At Design Society, the screens showcase the moves of Hing Chao, martial arts maestro and founder of Earthpulse and The Orochen Foundation. First shown at the boundary-breaking South by Southwest Festival in Austin, Texas, ANIMA is a glass globe that analyses your movements and then changes colour and plays different music depending on your mood—or what it thinks your mood to be. Can ANIMA really tell what you’re feeling? Can a machine respond to human emotions? Meet ANIMA and find out. Can you imagine a fabric that glows in the dark, releasing all of the sunlight it’s absorbed during the day? It might sound like something out of Star Trek, but the technology is already here. 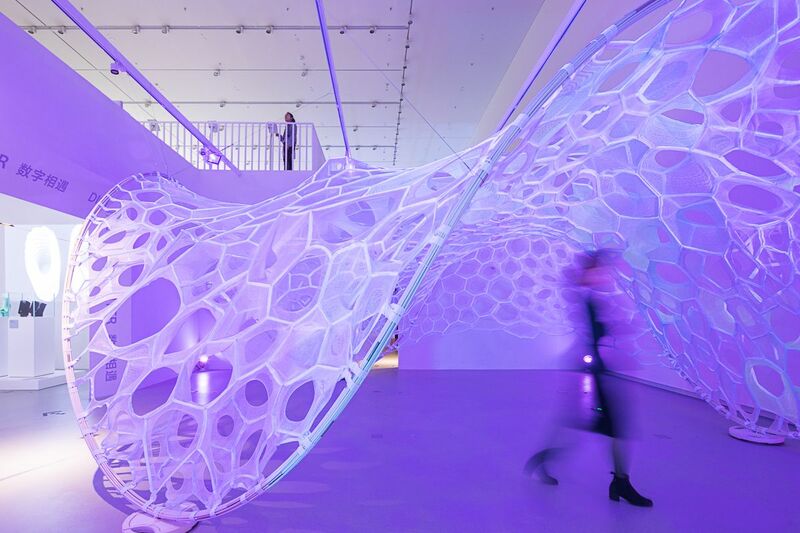 Designer Jenny Sabin incorporates this high-tech material into PolyThread, a futuristic seven-foot-tall pavilion made from knitted fabric that’s on show in Design Society’s inaugural exhibition, Minding The Digital. Aaron Koblin’s animation Flight Patterns is on show in Values of Design, the inaugural exhibition in the V&A Gallery at Design Society. Mapping all of the planes that flew over the United States over a 24 hour period in 2008, Flight Patterns is a mesmerising animation that reveals the invisible highways in the sky, and that shows the ebb and flow of air traffic during the day. Designed by renowned Japanese architect Fumihiko Maki, who’s currently working on the new United Nations headquarters in New York, the Design Society building is a work of art in and of itself. Once you’ve wandered around the airy galleries, make sure to climb the outdoor steps to the grassy roof terrace, which provides expansive views over Shenzhen and Hong Kong. Hing Chao This martial arts enthusiast is founder of the HK Culture Festival.